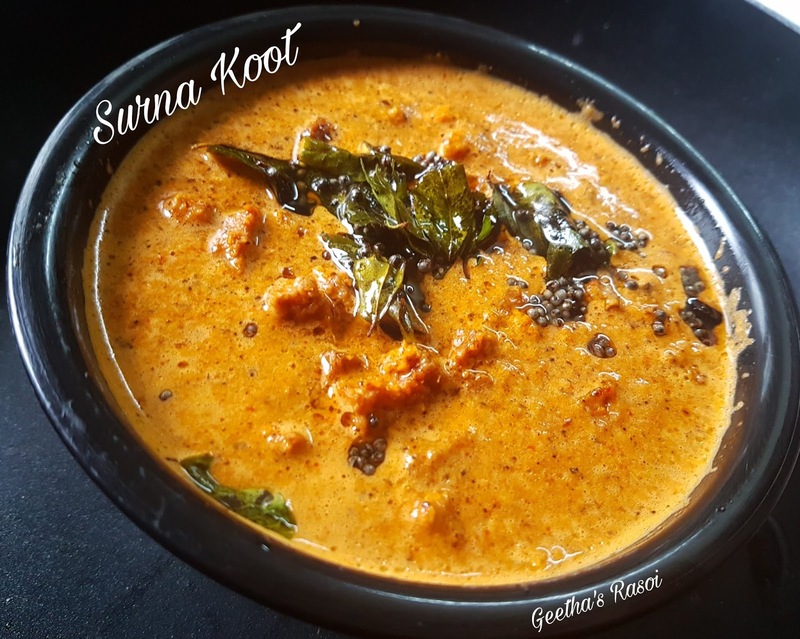 Typical Konkani delicacy Surna koot goes well with hot rice and papad. Cut yam in to small pieces, wash and strain then apply little salt, keep aside for 10 minutes then fry them till crisp and keep aside. Heat little oil in a sizzling pan and fry red chilly for few seconds, then in the same oil add coriander seeds, methi seeds and hing, fry till nice aroma comes. 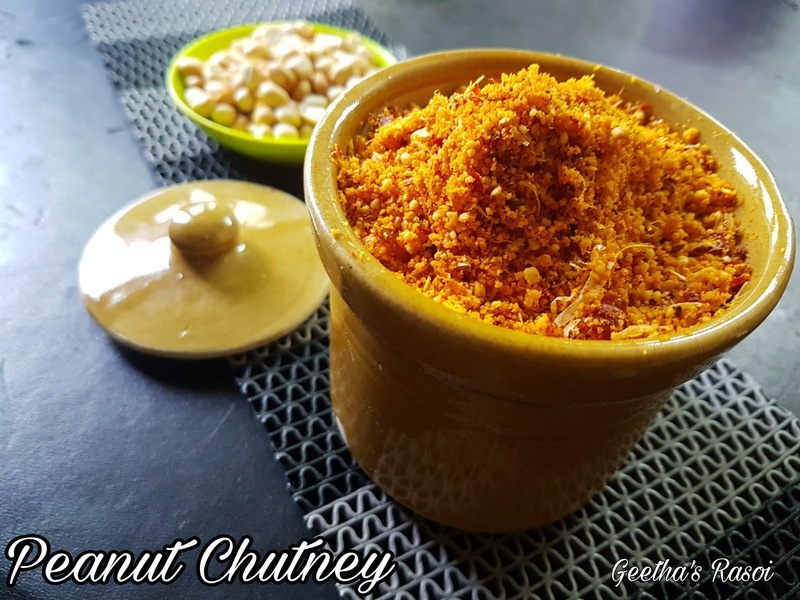 Then grind this with grated coconut, tamarind and fried red chilly into fine thick paste. Add little water and boil for few minutes, then give tadka of mustard and curry leaves. Then add fried yam pieces and mix well. 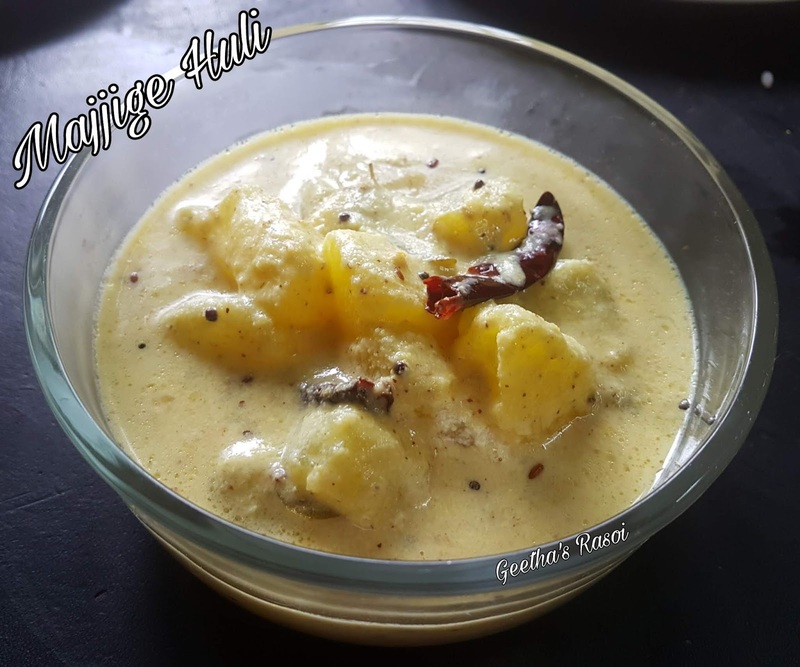 Majjige huli is a very popular dish in Karnataka, with mild gravy, prepared using ash gourd, coconut, butter milk and minimum spices. Since ash gourd is a very low calorie vegetable, its good for diabetic patients and helps in weight loss. Soak Bengal gram/chana dal in ¼ cup of water for 30 minutes. Remove skin of ash gourd then cut into cubes. Then pressure cook it with pinch of turmeric powder and salt for 1-2 whistles. Grind coconut, soaked channa dal, green chillies, coriander seeds and jeera into fine paste. 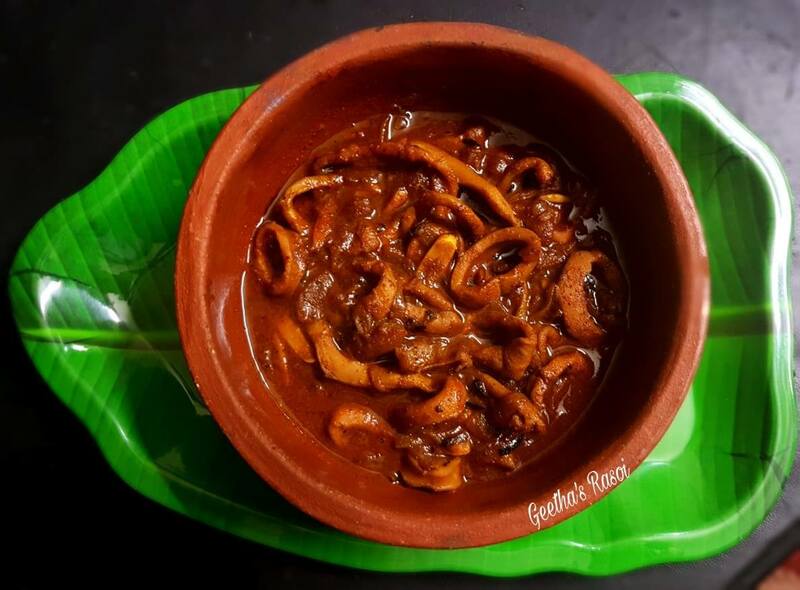 Add this to cooked ash gourd, boil till its gravy becomes thick. Then add butter milk and boil for few seconds. Heat oil in seasoning pan, add mustard seeds and curry leaves. Pour this on the curry. 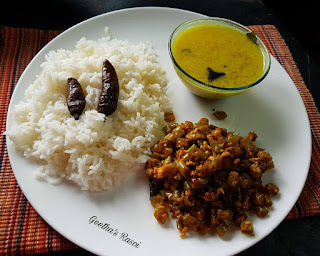 Serve Kumbalakkayi majjige huli with steamed rice. Slit green chillies, add salt and 1 cup of water and boil for 5 minutes. 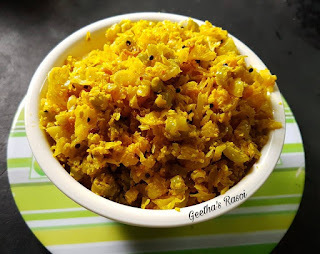 Grind grated coconut, turmeric powder and jeera into fine paste. Add this to green chilli water and boil for 5 min. then give tadka of mustard seeds and curry leaves. Soak lobia overnight, then pressure cook it for 2-3 whistles and keep aside. Cut pumpkin into small pieces, add turmeric powder and salt, pressure cook for one whistle. Take ½ cup of grated coconut, garlic, jeera and red chillies into paste. 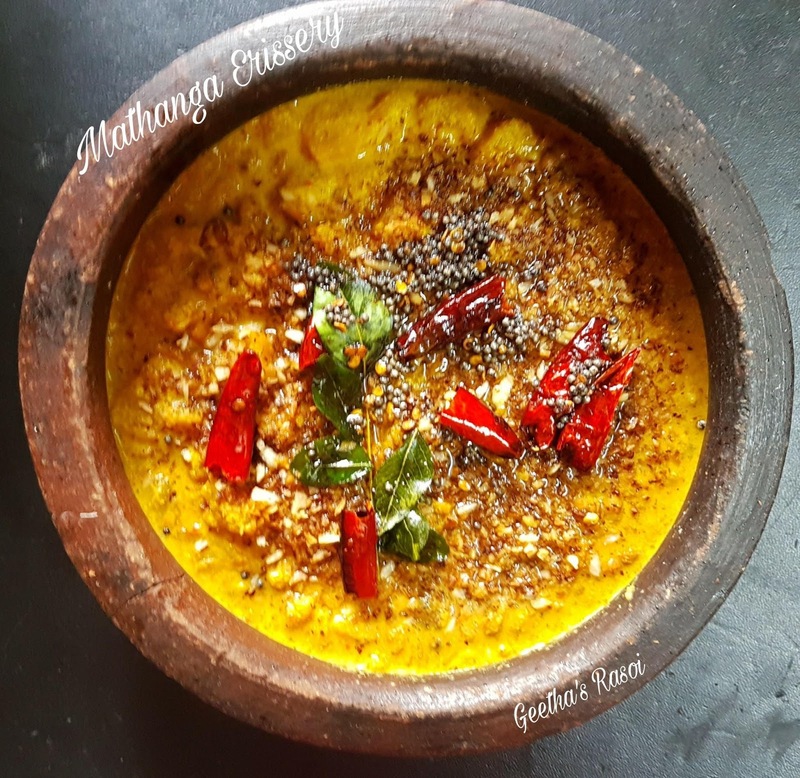 Add this masala to cooked pumpkin and lobia. Boil it for few minutes. Meanwile, dry roast ½ cup of grated coconut, sprinkle roasted coconut over the curry and give thadka of custard and curry leaves. Soak raw rice and boiled rice for 2-3 hours. Then grind it with butter milk, green chilly, grated coconut and salt into fine paste. 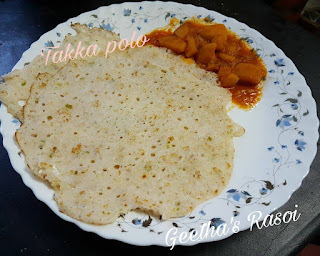 Heat tawa spread dosa batter, add little coconut oil over it, cover the lid, cook for few minutes, turn it and cook for few minutes. 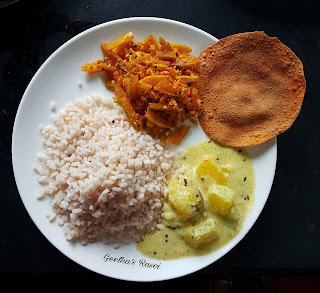 You can have it as it is or with any side dish or chutney. Cut and clean the prawns and keep aside. 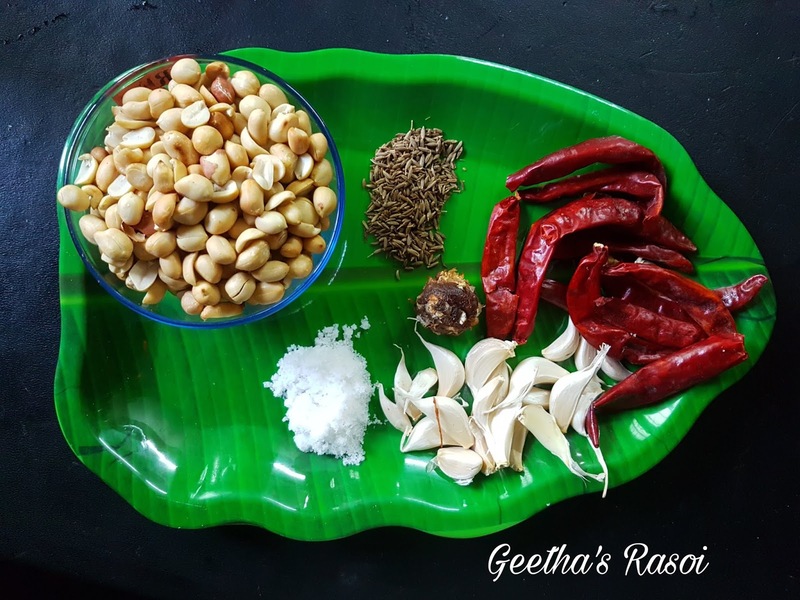 For the 1st marination, mix all the ingredients in a bowl and evenly rub the prawns with this marinate and keep aside for 15 mts. 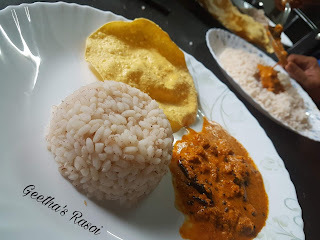 Then for 2nd marination, put the hung curd in a bowl, add remaining ingredients, mix it gently, then add marinated prawns, mix it well, keep in Refrigerator for minimum 1 hour. 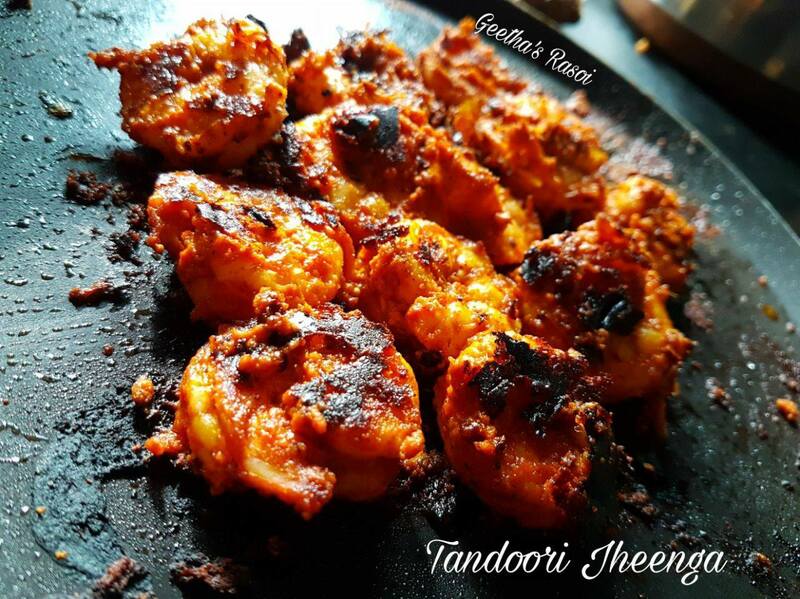 Heat tawa, grease butter on tawa, then keep all the prawns, then baste with butter and roast again for a few minutes both sides. Healthy yummy Tandoori Jheenga ready to eat. Note:- for best result charcoal grill can be used for this. Here I used iron tawa. 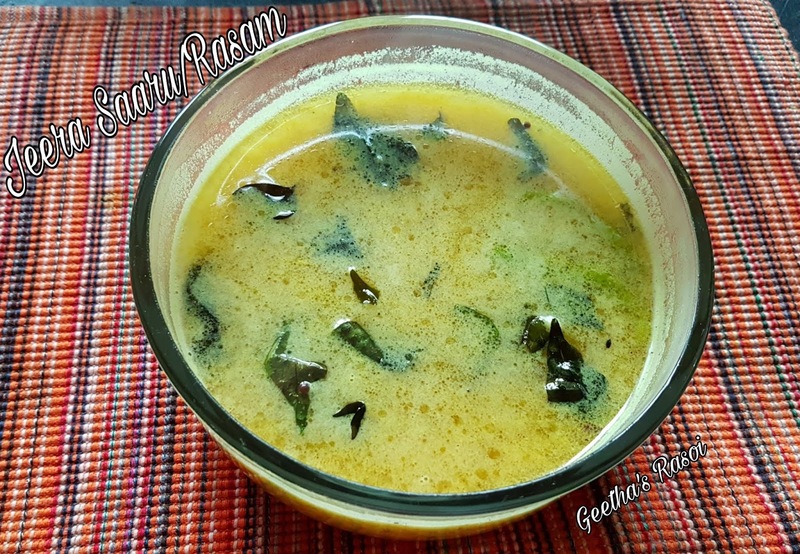 Heat oil in a thick bottom pan, add mustard seeds, when it splutter, add garlic and curry leaves. Fry till light brown. 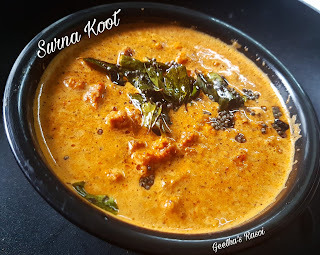 Simmer the gas, add chilly powder, coriander powder, and salt and fry for few seconds(make sure it does not get burnt). 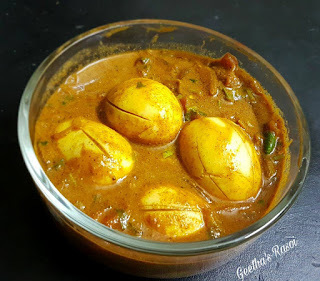 Then sprinkle little water, cut boiled eggs into halves, slowly place them over the masala. Sprinkle garam masala and pepper powder, mix it slowly, so that masala gets coated evenly. Finally sprinkle coriander leaves and roast it for few seconds. This can be had as side dish for chapathi or rice or as a starter also. Boil eggs and keep aside. 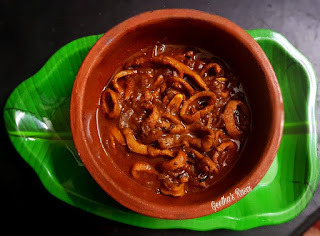 Heat oil in a kadai, add thinly sliced onions, fry little, add chopped green chilly, curry leaves, little salt, fry till onion turns light brown. 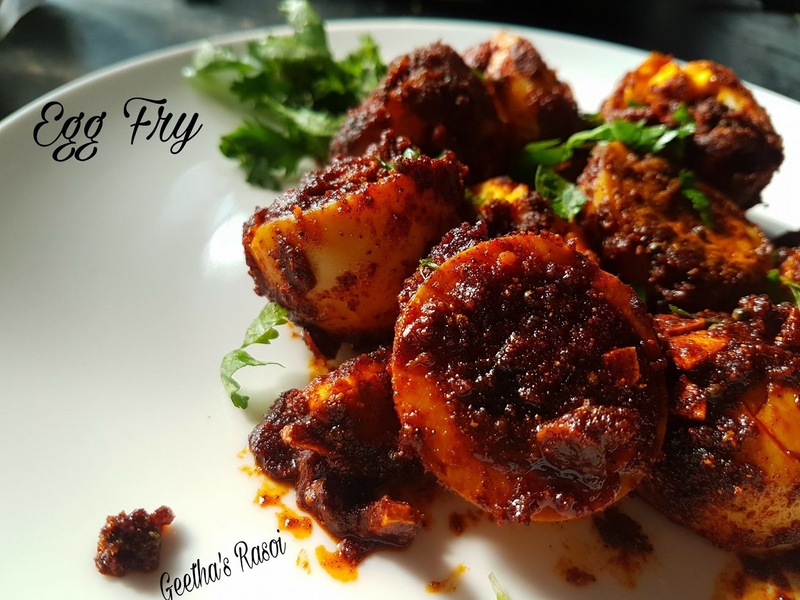 Add ginger and garlic paste and fry for a minute, then add turmeric powder, chilly powder, pepper powder, coriander powder and garam masala and fry for 3-4 minutes, then add chopped tomatoes and fry till tomato gets cooked. Once tomato is cooked, add little water, add salt to taste, bring it to boil then add boiled eggs(give cuts to the eggs so that masala gets coated evenly). Then add chopped coriander leaves and thick coconut milk. Gently mix it with gravy, once it boils switch off the flame. Serve with ghee rice or roti or appam.